There is a significant amount of debate in the personal finance community about the benefits of being mortgage free. Many people love the idea of being completely and wholeheartedly debt free – mortgage included. They say you just sleep better at night, and you haven’t lived until you have a life of no payments. However, others in the community believe it’s financially wiser to carry mortgage debt and use any excess cash to invest in the market instead. They say the math works out better in the long run. In many ways, it comes down to individual preference and whether or not you think the pros outweigh any cons. 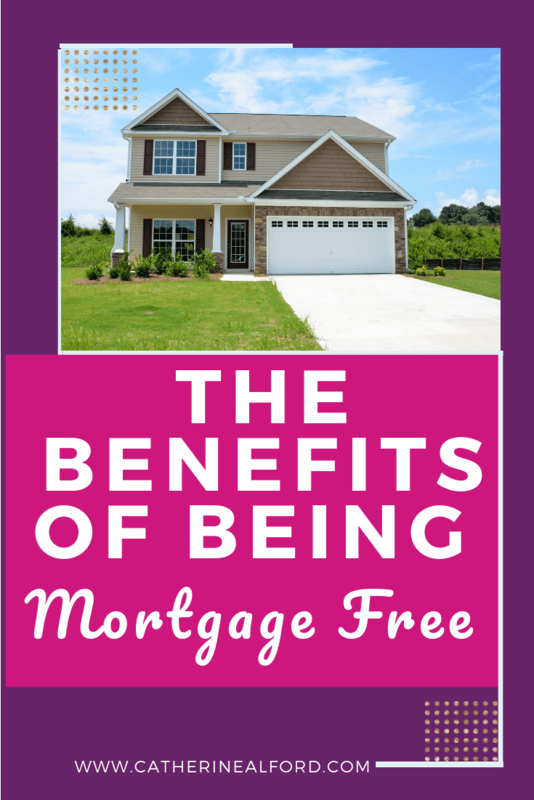 The Benefits of Being Mortgage Free – What Do I Think? Well, I think it all comes down to your personal comfort level with debt. I hate the feeling of debt and look forward to a life completely free of payments. However, I am not in a big rush to pay off my mortgage. It’s actually last on my list, after my husband’s medical school loans. But, I thought it would be fun to hear from someone who *has* paid off his mortgage, who knows the benefits of being mortgage free firsthand. So, I’m very happy to welcome Andrew Daniels from the blog Family Money Plan below. Andrew is a very good friend of mine. We’re in a mastermind group together and talk every week. He’s extremely hard-working, intelligent, and has a very sound understanding of personal finance. So, it came as no surprise to me that he and his wife knocked out their mortgage debt in their 30’s. They hustled. They saved. They killed it. And, the story is so inspirational that I had to share. 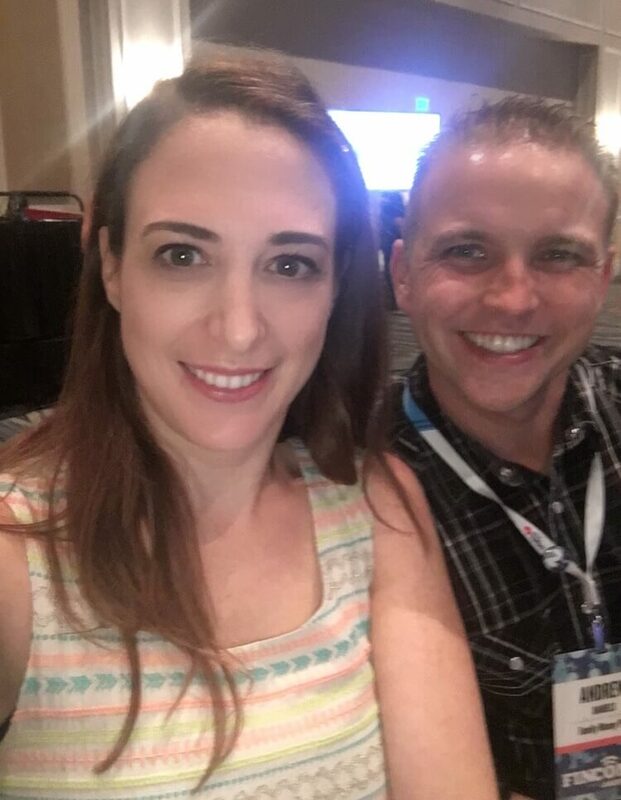 Andrew & Me at FinCon 2018! You know how you read about those freaks of nature who get all crazy and decide to pay off a ton of debt? And in doing so, they do a bunch of side hustles and work themselves to death to pay off their debt in a relatively short amount of time. Don’t get me wrong, I’m still a freak of nature. Because we did manage to pay off our house in 6 years. I wish I could tell you I started a blog and that helped pay off my mortgage faster. The truth is I wanted to start a blog, and didn’t because I wouldn’t allow myself the $4 a month in hosting to attempt it. Maybe the better question is, what did we do? In short, we became masters of our finances. We picked one goal (mortgage freedom) and made that our sole focus for 6 years. But I’m getting ahead of myself. Let’s back up and give you some perspective. My name is Andrew, and my internet claim to fame is that I paid off my house in 6 years (I wish it was something cooler, but you know, you take what you get). But it didn’t start out as this big crusade. In fact, the idea to pay off my mortgage quickly was born out of the most unlikely places. Digging holes and planting trees. My epiphany came from a weekend of manual labor. We were into our newly built home and to save $1500 I decided to dig holes to plant the 25 trees we bought (as a blogger, you might imagine that I’m not cut out for this type of work, and you would be right). Still in the heat of the day, digging in hard soil from sun up, to sun down, you get a lot of time to think. I was playing with these numbers in my head and I realized just how much I hated digging these holes. Then a number flashed before me. I had 30 more years of doing stuff like this, because that’s how long my mortgage would be forcing me to cut costs like these. I mean, it really sucked, and it spurred me on to look for a way out. So on a Saturday night, after digging holes and thinking about it all day, I sat down with a spreadsheet and figured out how I could pay off my mortgage faster. I realized that if we took action now, the compounding effect would kick in and we would be saving a lot of money over time. From there, I created a plan and changed it to suit our needs as time went on. I took the approach of dream big and see what happens. Now that we are a few years removed from being in debt, I look back on it and think it was the best time of life to do it. My kids were young, and we were in a new place. With young kids, your life is in upheaval so adding something like this to our lives felt easier. That might be the rose-colored spectacles of hindsight, but focusing our finances on this while we strengthened our new family dynamic felt right. Because let’s be real, when you are a new parent, you are kind of thrown to the wolves (wait did I just compare babies to wolves? Yikes!). You get very little sleep, and time has this weird way of flying by and standing still. So throwing in a goal like this didn’t feel any stranger than all of the other things going on in our life. Before we go into this, there is a question that comes up, so I’ll address it here. A good part of how we were able to pay off our house quickly is because we didn’t max out our budget when we bought the house. It’s a rare, and vey honest answer. Because we didn’t max out our house spending, it allowed for more room in our budget for us to put money down. Ok, let’s get into some of the things that we gave up. This one everybody seems to find shocking. For the first 3 years we only used an emergency flip phone, which we shared as a family. You couldn’t even text on it, or maybe you could, but that would have cost money so we didn’t text. It was only after we had to rush our eldest child to the emergency room that we decided we should both have a phone. My wife and I are travelers at heart. It was the first thing we talked about the night we met. So for us to say, “No travel until the mortgage is gone” was a big one. But let’s be honest. Traveling with young kids isn’t a lot of fun. Sure the flights might be free, but you aren’t traveling with your kids for their sake. You say it’s for them, but they aren’t going to remember it. In the end, for 6 years our travel consisted of a weekend away with my parents (their treat) to a hotel a couple of hours away in North Dakota. Not exactly the world traveling we would have liked. But we both agreed that it was worth the sacrifice. So right around the time we started to pay down our house, we found out my daughter had many allergies (remember that emergency room trip from earlier?). This meant that we had to learn to cook for our growing family. We searched for some great recipes online and started to replicate our favorite dishes. Things like Fettuccine Alfredo from Olive Garden, and Papa John’s pizza sauce, were just a couple of things that would become staples in our make at home meals. We are very lucky to live around family. Whenever possible, the grandparents would take the kids so we didn’t have to pay for daycare that day. Our cars are old. Not ancient, but old, I still drive a 2004 van that was worth $2000 when we got it. Before that we drove a ’97 civic my wife used to drive to college back in the day, and a 2003 CR-V that was rusting out. I love new cars, but the cost was prohibitive for us at the time. Not to mention that they depreciate in value so quickly. One of the big reasons why we could pay this off quickly was that we didn’t have car payments soaking up a lot of our money. Yes, people made fun of us (and still do, I mean, c’mon it’s a 2004 van…it’s big easy target). And yes, it was hard to watch everyone drive around in newer cars when your car is 10 years old. But it was a short-term sacrifice for long-term gain. Looking back on it, I wouldn’t change anything. This was more of a swap, but $20 every Friday for take out pizza wasn’t in our plans. Instead we used our bread maker to make bread dough and we made our own pizzas. We built the house with one nice upgrade: geothermal heating. Basically, it uses latent heat from the water that is under ground and you can heat your house for a fraction of gas or electricity. This meant our utility bills were a third of what everyone else around us was paying for heat (and cooling), which is important because we live in a place that has been colder than Mars at times (at the time of writing this it’s threatening to go down to -53). This isn’t so much of a cost cut, as it was a cost savings. I love my coffee, it’s hard for me not to have one on the go during the workday. So I switched to bringing my coffee from home. Then I took it a step further. I realized that I was drinking a lot of cream and sugar, so one day I just decided to switch to black coffee. I decided I would keep drinking it until I liked it. After a month it was all good. At a time when we were just getting our professional hockey team back, and it seemed like every other week there was a performer I wanted to go and see, we stopped going to these things. We are just starting to get back into the concert scene, and I really missed going to these concerts. So we had family time, all the time. We talked, we played games, we learned to enjoy our new family dynamic. That’s something we still do today. I can honestly say that I enjoyed those years immensely, and while going without some of the things I mentioned was an adjustment, I’m happy we did it. I would put out the argument that if you were going to embark on paying off your debt quickly, that doing it with a young family is the best time. You don’t need to put your kids in lots of activities. They are happy to just be kids. It’s as time goes on that it gets harder, when your time and money is going towards their activities and other things to make memories. Looking back on this I’m not sure I could do it all again. It’s like running a marathon, the last thing you want to do when you finish run, is to do it all over again. But I’m happy of the road we took. Yes, I could have done it quicker if I had decided to work more, and yes, it’s not for everyone. But family is first in our house. I’m happy we did it because now we live a life that I could only dream about. But that’s a whole other story. One of the biggest costs you have in your life is mortgage interest. By taking small steps, you can reduce this cost by thousands, or even tens of thousands over time. Becoming mortgage free doesn’t have to be this huge cost cutting, life changing, adventure. In fact, putting small extra amounts down on your mortgage today can add up to huge savings over your mortgage allowing you to pay it off years earlier. If you want to create your own mortgage free plan, check out our Mortgage Free Masterplan. It’s a one hour program that shows you how to create a plan to pay off your mortgage faster and shows you how much more you can save by doing this. You can see the details and cost of the program here. Or if you want to take the next step with your finances, check out my 10 Step Money Kickstart Challenge. The challenge includes the 10 steps we took to turn our finances around, and they still work today. It’s absolutely free so you can get started on your own successful money journey. Andrew Daniels is a personal finance writer and mortgage freedom expert. He writes at Family Money Plan, a site dedicated to helping busy parents, who are stressed out about money, find their way out of the mess by providing them easy action steps so that they can create a life they love.